With their thick double coat and tail carried curled over their back, the Norwegian Elkhound is a medium sized hearty breed that can withstand harsh cold conditions. They have a wedge shaped muzzle, pointed prick ears, a deep chest and thickly padded paws. 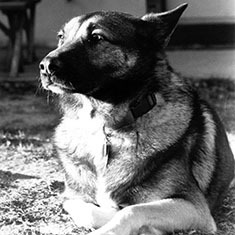 As the name suggests, Norwegian Elkhounds originated in Norway. Male Norwegian Elkhounds are 19 to 21 inches (48 to 53 cm). Female Norwegian Elkhounds are 18 to 20 inches (46 to 51 cm). Male Norwegian Elkhounds weigh 50 to 60 pounds (23 to 27 kg). Female Norwegian Elkhounds weigh 40 to 55 pounds (18 to 25 kg). Norwegian Elkhounds are gray with a lighter undercoat and undersides. Their muzzle, ears and tip of the tail tip are black. The Norwegian Elkhound has a thick weather resistant double coat and is a heavy shedder and therefore requires regular brushing. This breed is free of a doggy smell and the coat is dirt and water resistant. Enthusiastic and friendly the Norwegian Elkhounds make an excellent family dog. Its independent nature sometimes makes it resistant to obedience training, and they may bark a lot. Norwegian Elkhounds make excellent guard and watchdogs. They are friendly and energetic and have very docile dispositions. Prone to Progressive Retinal Atrophy, kidney disease, hip dysplasia, pyotraumatic dermatitis. Norwegian Elkhounds should not be overfed as they tend to gain weight easily. The expected life span of Norwegian Elkhounds is 12 to 15 years. Norwegian Elkhounds thrive in cold climates. They are extremely active dogs and require at least one hour of exercise per day. This breed may roam if it finds an interesting scent to follow. Norwegian Elkhounds also make excellent jogging or cycling partners. 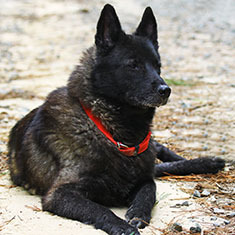 Norwegian Elkhounds are in the Hound Group. Find Norwegian Elkhound Puppies with our Free Breeder search!